The stage was set. 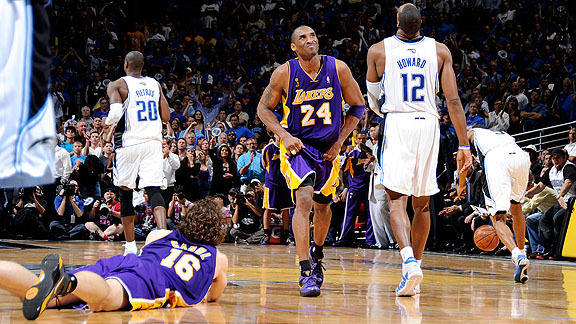 In the year of 2009, the Finals were truly supposed to be a clash between LeBron James and the Cleveland Cavaliers against Kobe Bryant and the Los Angeles Lakers. For whatever reason, that never happened and instead, we were treated to Dwight Howard and the Orlando Magic taking on the Lakers. The path for both teams to get there was very interesting as the Lakers finished with an amazing 65-17 record and the Magic finished with a 59-23 record. Despite good records for both teams to make the playoffs, they both faced challenges in the actual playoffs to make it to the Finals. The Lakers would make easy work of the Utah Jazz in 5 games, before struggling with the Rockets before beating them in 7 games, then defeating Carmelo and the Nuggets in 6 games. The Magic would end up going to 6 games with the 76ers, before going to 7 games with the Celtics, and defeating LeBron and the Cavs in 6 games to advance to the Finals. The Magic were at a disadvantage but they had the will to win. When it came time for game 1, many wondered would Kobe and company have an easy ride or would Dwight and his team truly pull off an upset? Time would tell. -The Lakers are truly an amazing team during this period and game 1 was just yet another example of how strong they were at this time. The Lakers dominated this game and would end up with a 100-75 victory to go up 1-0 in the series. The Magic couldn't manage to get anything rolling and the Lakers truly capitalized with Kobe finishing with 40 points and 8 assists to lead his team to victory. The Magic didn't have many solid scorers this game and hoped to be able to take the time and regroup and get things back on track in the series with game 2. Would they manage to be effective? We shall see. -This game was a little closer and the Magic made it truly competitive. However, the 1st quarter got off to a truly slow start as they finished the quarter tied at 15-15. Rashard Lewis would account for 18 points in the second quarter, as the Magic only scored a total 20 points in that quarter. Rashard would dominate period in this game, and finish with 34 points, leading all scorers but it would still not be enough. 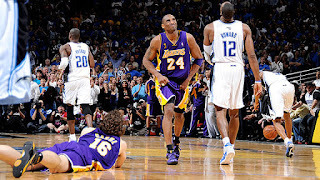 This game would go to overtime, but the Lakers clinched the win 101-96, led by Kobe with 29 points and 8 assists. The Lakers led the series 2-0, could they be going for a sweep here? -The Magic refused to be swept. They came out shooting with a vengeance in game 3 and shot 63% from the field the entire game. They were hungry and played hard this game, unlike we had seen in the first 2 honestly. 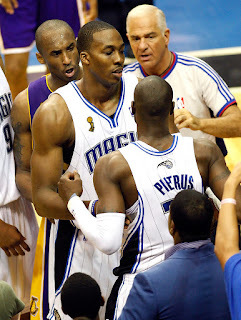 They would walk away with the victory in this game 108-104, led by Dwight Howard with his 21 points and 14 rebounds. Kobe would play very well for the Lakers and keep them in the game with his 31 points and 8 assists, but it would not be enough as the Lakers lost and the series was now 2-1. 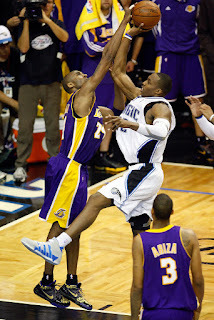 As game 4 approached, could the Magic tie the series or would the Lakers go up 3-1? -Both teams came out to play their hardest. The Magic would look good in the 1st quarter, and Dwight would play amazing in that quarter with 11 rebounds and 4 blocks to start the game. He would finish with 21 rebounds for the whole game, and it seemed like the Magic had a firm control on the game as they took a 12 point lead to halftime. However, Trevor Ariza would be a difference maker in the 3rd quarter for the Lakers and would score 13 in that quarter alone to give the Lakers a lead. However, the Magic would come back and make a push to take the lead late. However, Derek Fisher would hit a vital three pointer near the end of regulation and the game would go to overtime. With a lot at stake in this game, the Lakers played harder in overtime and walked away with a victory 99-91 to make the series 3-1. 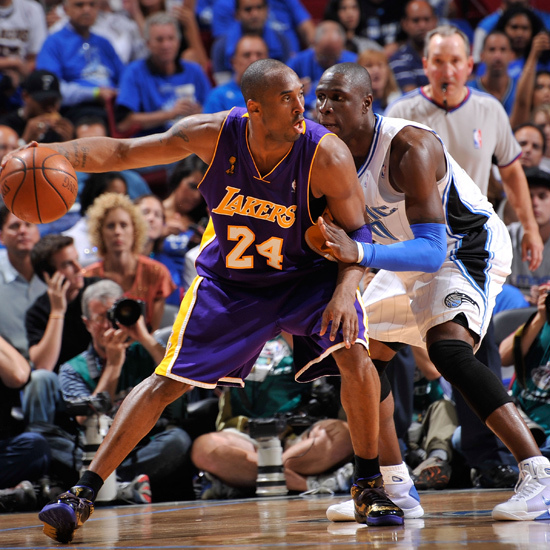 Kobe would finish with 32 points and 8 assists on the night, leading all scorers. With the Lakers being one game away from winning the title, the Magic would have to fight hard in game 5 to send the series back to LA and for a game 6. Could they pull it off? -The answer to that question would be no. The Magic started off well, showcasing a ton of heart and even taking a solid lead early in the game, but the Lakers would go on a 16-0 run and never really look back. The Lakers led by as much as 18 in the fourth quarter, and while the Magic attempted to comeback, they just didn't have enough fight in them to win. 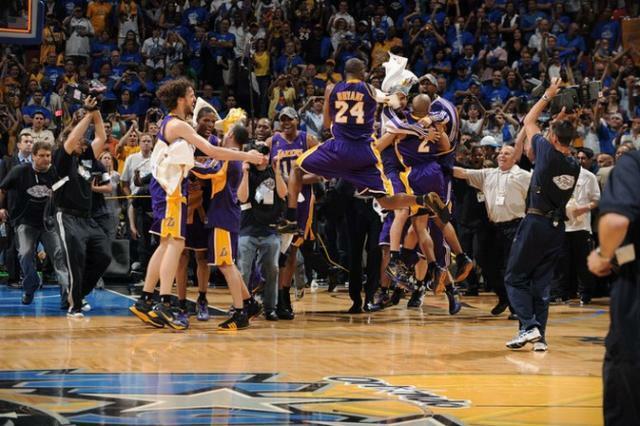 The Lakers would soundly take a victory 99-86 and reign supreme with their 15th title win. Kobe would play well yet again, with 30 points and 5 assists, gaining his first NBA Finals MVP on averages of 32.4 points, 5.6 rebounds and 7.4 assists per game. He was essentially unstoppable the whole series. For the Lakers, this was redemption, as they lost to the Celtics the previous year in the Finals and now they were able to right that wrong. For Kobe, it was his first title without Shaq and his first NBA Finals MVP award. It had to feel amazing to have that honor. 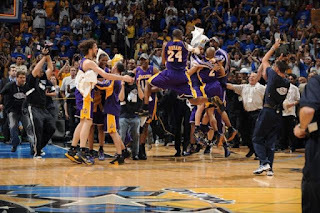 The Lakers were once again NBA Champions and on top of the mountain.